In compliance with the order of Jammu & Kashmir Governor and Shri Amarnathji Shrine Board (SASB) Chairman Mr. N.N. 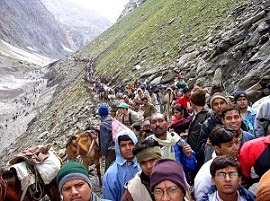 Vohra, SASB Chairman Mr. Navin K Choudhary has announced that all pilgrims that hold valid permits for this year's Amarnath Yatra will be provided a free insurance cover of Rs 1,00,000 against accidental death within the state during the entire 'Yatra' period. Under the scheme, which will be free for all pilgrims having valid permits, will provide coverage one week ahead of the commencement of the pilgrimage and will end one week after its conclusion. “It will cover any accidental death which takes place anywhere in the state while travelling to the 'Yatra' base camps or while heading for the shrine", Mr. Choudhary said. He has also appealed to all pilgrims that it is in their interest to obtain valid registration cards after securing a compulsory health certificate. It is in the interest of all pilgrims to undergo a proper medical check-up before registering themselves, for which elaborate arrangements have been made by the Shrine Board, he added. This year's Amarnath Yatra will commence on 28th June and end on 10th August. The registration for the 'Yatra' will start on 11th March.